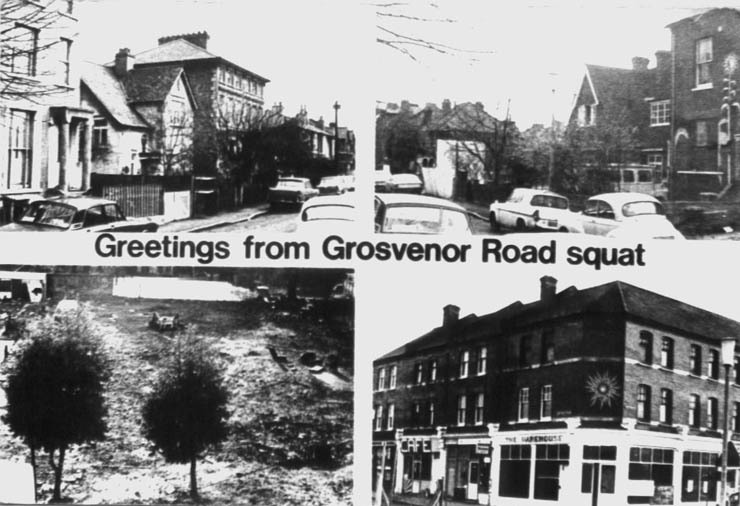 First there was Eel Pie Island, then there was Grosvenor Road. Eel Pie Free Commune only lasted for one year but it was like a ripe seed-pod that dispersed it's seeds all over the world with ideas of communal living. Ironically, the poorest (least potent) of those seeds fell very close to home and, arguably, produced the best example of spontaneous free community. 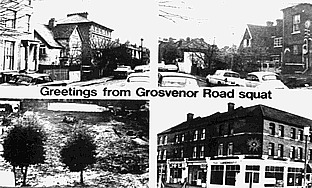 It was only a handful of people who experienced the Eel Pie phenomenon that lived in Grosvenor Road. The rest were scattered and probably didn't even know of it's existence. Except for No's 1 and 2, all the houses on both sides of the street up to No 19 were squatted and became actively involved in the social / communal spirit. There was no leadership, only influence. Each house had it's own character. Some were run like conventional households, were one might have to knock on the front door to enter. Some were like blocks of flats were the front door was wide open, and one would have to knock on the door of the room they wanted to enter. Some were just wide open to anyone and everyone. I think most people probably had access, one way or another, to most of the rooms in the street. If one needed the comfort of other people at any time between mid-day and 3am, it was usually easy to find. There was nearly always a room or a house were there was some social-interaction, free for anyone to join in, or just be amongst. It became like one big, strange family of over one hundred people, and lasted for four years. The freedom extended to being free of any organised set-up, which allowed variation, and freedom of expression. It mostly consisted of people under the age of forty and, sadly, a majority of them were single males but, happily, there were single females, couples, children and even one or two older people. We valued the oldies and the children because, ideally, we would have liked to represent the the same proportions as in the main population. The first house to be opened was No. 7. It remained an 'open-house' until the end. It was only a small house but No. 7 was the beating heart of the street, a sort-of, centre of communications, a perpetual forum, mainly enabled by Chris W, Scratch, Seamus, Joelle and Mac. Although the rooms were occupied by them, and others, it felt like the house belonged to the whole street and people were free to enter any room at any time. The most dilapidated houses were, the adjoined No.s 9 and 11. They were too far gone to be worth making properly habitable. They were occupied at first but they were quite squalid and soon became the first building to be demolished. It was a sort-of 'blessing in disguise' because, after clearing-up the rubbish and rubble left behind, that empty plot became the communal recreational space, which, I believe helped psychologically, to bind the community.